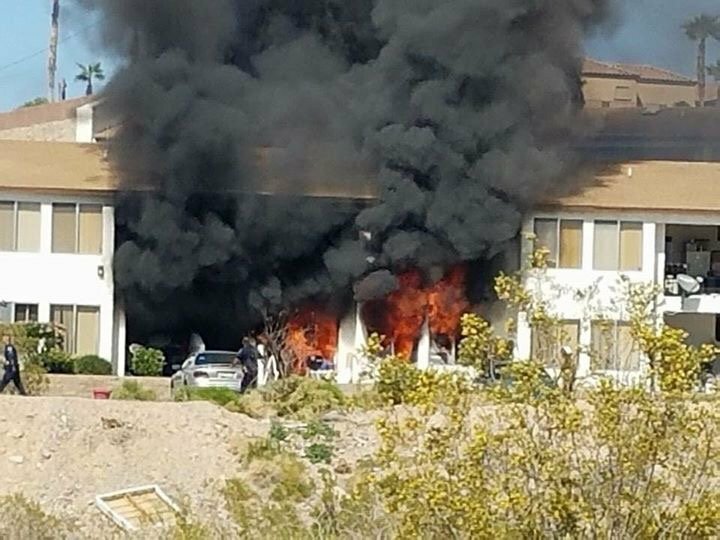 The Bullhead City Fire Department responded to the report of an apartment structure fire at 1690 Marble Canyon Dr. at approximately 2:21 p.m. Sunday afternoon. Initial reports from dispatch stated that apartments were on fire at this location. Engine 711 arrived first on the scene taking command and reporting a two-story apartment complex with active fire in a first-floor apartment and spreading to the second floor. Engine 761 arrived shortly after and began an aggressive fire attack and knocked the fire down on the first floor. Additional units from BCFD and the Fort Mohave Mesa Fire Department arrived to assist as Battalion Chief Kinsey took command and assisted the Bullhead City Police Department with evacuations and crowd control. Fortunately, firefighters were able to contain the blaze to only two apartments with smoke damage to four additional units. A total of eight are displaced and being assisted by the Red Cross at this time. Battalion Chief Kinsey advised there were no reports of injuries and crews were able to save one feline, but sadly one is still missing at this time. Members of the BCFD CERT team arrived to assist with the rehab efforts along with the Clark County Fire Department. BC Kinsey requested to have a fire investigator respond, and the cause of the blaze remains under investigation at this time.